Where your birth is a joyful celebration! I guess I knew the end was in sight on Sunday. My mother had been keeping Violet, our 2 year old, for us just in case I went into labor. But when the weekend came and went, we asked her to bring her back to our house on Sunday afternoon. Even though I hadn’t seen my daughter in a day and a half, I didn’t feel like playing or cuddling due to some crampiness and extra Braxton Hicks contractions. I excused myself to go and take a nap, but I wasn’t able to get comfortable and never fell asleep. I got up and we all made dinner. After dinner I left and went to a yoga class to try to relax and stretch out my muscles. I came home and felt so antsy that I stayed up late baking and writing in my blog. In the back of my mind I was well aware that I was well past my due date and was very likely in early labor. There was only one way to find out, and that was to try to go to sleep and see if I could actually drift off. At midnight I finally got into bed and wondered if I would be able to sleep though the Braxton Hicks contractions that seemed to come every 7-10 minutes. I slept until 1:30 a.m., when I awoke to use the restroom, and then fell asleep again until around 3 a.m. It was then that I knew I was going to meet our baby that day. I laid in bed and timed contractions for a while and noted that they were anywhere from 1-2 minutes long, pretty uncomfortable, and anywhere from 5-8 minutes apart. I made a silent goal to wait until 5 a.m. to call or wake anyone. I wanted everyone to be rested and clear headed for our big day – Michael and Toni (our midwife) included! I opened up a book, Supernatural Birth, that I’ve been reading and rereading during my pregnancy and silently read through a prayer in the very back. This third sighting of blood made my heart race. I knew that I could either choose to be scared or choose to be calm. I chose to be calm and dialed Toni. She answered on the second ring and I told her that I was fairly certain I was in early labor and had just experienced another gush of blood. It was easily enough blood to soak through several large maxi pads. She told me she would be at our house soon and arrived shortly. She checked Middle’s heart rate and my blood pressure, which were both strong. We talked about her checking to see if I was dilated, but because of my bleeding, we decided not to check just yet. From about 5 a.m.-7 a.m. there wasn’t much action. Toni and her assistant, Candice, prepared our bedroom for the birth. They stripped our bed and put plastic between the sheets and pillowcases, covered some carpeted areas with pads and towels, used a crock pot to warm compress towels, and set out various types of medical equipment. To be honest, I looked a little bit at what they were doing but tried to focus more on myself. I didn’t want my labor to stall. When I was having contractions I would try my very hardest to relax every single part of my pelvis. I kept telling myself that the more I relaxed and let my body stretch, the fewer painful contractions I’d have to go through. Some of them were hard and some weren’t as bad during that time. I would walk up and down our stairs, stand in front of my fridge and eat grapes, and move around on the birth ball in between them. They came around every 4-5 minutes at that point. Michael was really good about being nearby during contractions and massaging my lower back. It seemed like he knew exactly where he needed to apply pressure. Toni took my blood pressure and the baby’s heart rate at regular intervals throughout this time, and every time she did it was perfect. Around mid-morning things began to pick up. I decided to take a shower because the constant trickle of blood was bothering me, and I wondered if the warm water would help me to further relax and speed things up. I stood in the shower with the hot water hitting my lower back and leaned forward against the wall. I didn’t want anyone to bother or talk to me during that time, and everyone must have gotten the hint because no one did! Every time a contraction would come, I’d try to relax and imagine my body doing what it needed to do. I’d envision my hips widening and my cervix dilating. I also tried to imagine my baby’s head and body lowering further and further in my body. I prayed several times that my body would do what it needed to do and that there would not be any problems. I don’t know what it was about that shower, but it really seemed to help with my comfort! At that point I remember people asking me some questions about how I wanted to have the baby. Did I prefer to push on the bed, or on the birth stool? I sat on the birth stool during one contraction and immediately knew that was not going to work. I went back to my birth ball and willed my body to open up the last little bit that it needed to. I think someone suggested that I get checked again, and during that check I was lying on my back on the bed. As soon as she got finished checking me, a contraction began to build. I knew that if I stayed on my back during that contraction I would probably die from pain. 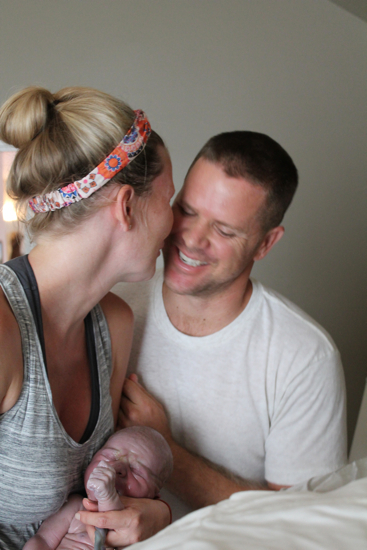 I didn’t know what else to do other than flip over and get on my hands and knees, and that is exactly how I stayed until our baby was born! I will admit that being on my hands and knees was not the most ladylike and graceful position, but to be honest, I kind of always had a hunch that I would deliver that way. Someone had the brilliant idea to put the birth ball right in front of me on the bed. I could lean forward onto it during contractions and push. 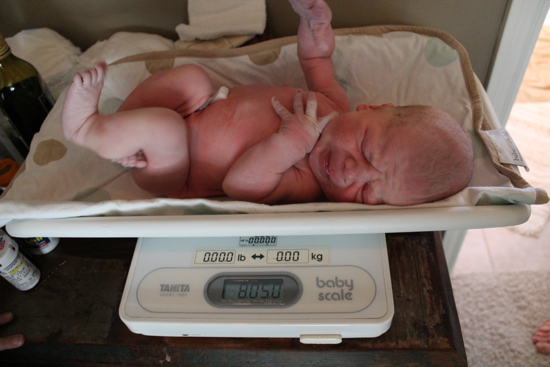 Pushing was like nothing I have ever felt, even with my first birth. When I gave birth to Violet (a natural birth in a hospital) I pushed in the traditional fashion in a hospital bed. From what I remember, pushing felt really good compared to transition! With this birth, however, the tables were turned. Transition wasn’t too bad, but pushing was some serious work and quite painful. 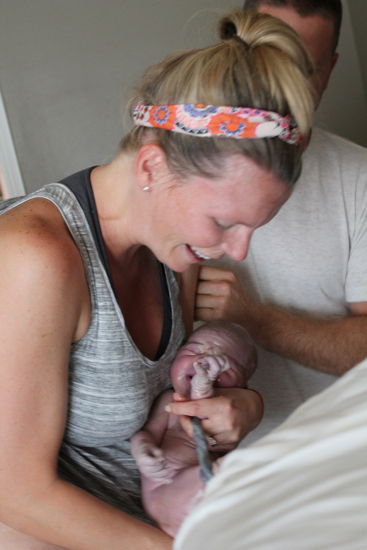 I guess the next few minutes were probably what surprised me the most about our birth. I had expected to immediately relax and nurse with baby for a few minutes, but I was instructed to deliver the placenta. I vaguely heard someone say, “She has lost enough blood, we need to get this placenta out now.” Everyone kept telling me to push with contractions. I’m still not entirely clear on why it was such a hurry or what the placenta had to do with the bleeding, but I trusted the professionals and did as told. I wasn’t very successful until everyone literally lifted me and put me in the squatting position. Finally I was able to bear down and get rid of the placenta that way. It felt very good to be finished. 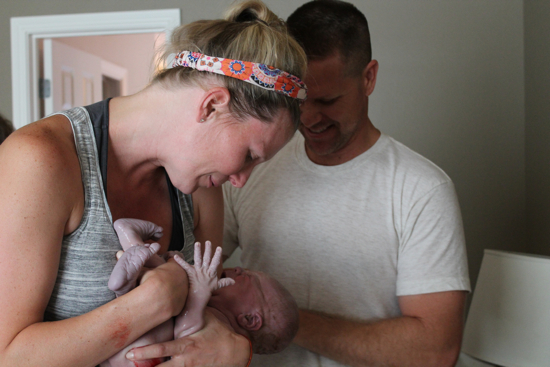 Michael and I spent the next precious moments inspecting and kissing all over our handsome little one. Toni asked us if baby had a name, and I looked at Michael expectantly. “John,” he responded. “John Rapsilver Griffin.” I was excited to hear him name our baby boy with such confidence. I knew that he had been thinking of that name, but there had been other names in the running and I wasn’t sure which he would choose until that very moment. John is the name of his father and his brother. Rapsilver is his grandmother’s maiden name. It was perfect! It wasn’t long before our room had been transformed back to normal, I had taken a shower in my very own bathroom, and Toni made me the most amazing adult diaper I’ve ever felt. (Ha.) 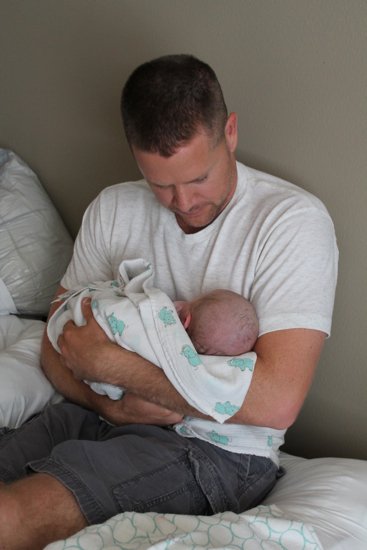 I cannot express how wonderful it was to be in the comfort of my own home during my labor and delivery. Three years ago I would have not considered a home birth, but I am so glad that I began researching different options and chose to go this route. It was an amazing experience! The recovery has been a breeze, and I didn’t even tear, despite having a baby that weighed nearly 1.5 lbs more than my firstborn. Little Johnny has been the most laid back baby, and we are loving these first moments with him as we adjust to being a family of FOUR! I guess it is somewhat fitting that I’m taking a break from a John Wayne marathon to write a birth story for my little boy. I’ve always imagined that we’d have a son, but now it’s real. I already have a running list of work for him to do, and I’ve already had a close family friend promise him a horse and a calf. Every time I call someone to talk about his entry into the world, I nonchalantly add that he was born here at the house. It’s not a testament of anything that has to do with me, but a simple and pointed brag about how awesome my wife is. Just before 4 a.m. I opened my eyes to a tap on the shoulder and Laura telling me that she thought it was time. The night before, my mom decided to spend the night just in case Laura went into labor. After I brushed my teeth, I walked over to the guest room and gave the same news to my mom. She was happy to hear it, and our 2 year old Violet was on the road to Gommy’s house in minutes. She had dreams of horses and swimming the whole way there I’m sure. Now it was just me, Laura, and our soon to come little baby. The only thing that would make this situation any more like I had imagined it, is if we were in the middle of nowhere, surrounded by Apaches, who are at my home out of respect bearing gifts to a new warrior being greeted into this world. Instead, we did have a midwife Toni, assistant Candice, and doula/photographer/placenta-pill-maker Rachel. Not a bad team. Laura and I have been through this once before, but it was in the hospital. All of her heavy breathing, mobility needs, deep concentration, and personal stage of laboring were seared into my brain. Before I went to bed she went into the cleaning, putting up dishes, making desserts, have to get ready stage. I kind of had a feeling that we were in for the long haul when I saw her shuffling around the kitchen cleaning things we haven’t seen since our wedding. When she woke me up around 4 a.m., she had already been in the “this is really happening” stage for a while. Being the wonderful wife that she is, she had allowed me to sleep and started getting her mind prepared by timing her contractions and concentrating on having a smooth and complication-free labor. In my opinion, her confidence in this stage was the key to a healthy Laura and baby. When our midwife pulled up around 5 a.m., I left Laura’s side in order to help Toni get everything upstairs. 14 trips later, we brought everything up except the car, so I think we were ready. Candice followed a little while later, so we all decided to just sit around, hang out, drink coffee, and talk about birthing babies. I didn’t have a lot of experience, but I can hold my own in any birth ball placenta eating circle around. After my second cup, I noticed that Laura had entered the “I’m going to go have a baby on my own” stage. She went walking up and down the stairs, through the hallway, and finally ended up in the shower. Once I saw this, I sent Rachel (our friend and doula) a text that she would be needed soon, and to bring more coffee on her way to the house if she didn’t mind. I had already told my family that we’d have a baby by lunch, but things were progressing right along. I’ve seen enough animals give birth to know that when they start hunting a spot to deliver, it’s almost time. I thought we were going to have to lock the doors to keep Laura close, but that wasn’t necessary. Rachel found her way in, so now it was time for the rest of us to help this dream become a reality. Once Laura got out of the shower, we all knew that this was it. Her face was determined and her breathing was getting heavy and deep. We watched in awe as Laura took the labors of childbirth in stride by shedding just a small tear and letting us know that our overdue present would soon be here. She crawled up on the bed, using the birth ball as a rest, and began to slowly push the baby out. It really only took four pushes. They were four long, hard, determined, strong, and beautiful pushes. The first was to get the baby close. The second allowed for Toni to help move the cervix for the baby to get its head through. The third got the head out, and the fourth delivered the body. Since Toni was catching and Laura’s position wasn’t convenient for anyone to see, I had to step back from rubbing her back to get a peek when the head came out. When I saw his face, I immediately got a big smile on my face. I was thinking it had to be a boy, but I was also just so happy to see our little one. I wanted to see if he was going to come out kicking and screaming into this world like Violet, or calmly taking in his surroundings and making sure all was well. He came out quietly in command. Toni attended to his nostrils in case he needed help getting some of the fluid out of his nose. Seconds later, Candice announced it was a boy and Laura was able to put her arms around our newest addition. While taking in some quick milk, Toni asked what his name would be. I looked at Laura and told everyone that it would be John. A strong name for a strong little boy. He’ll get his strength from his momma for sure. Each birth has given me the same feeling of respect, joy, love, and gratitude. What an incredible blessing that I have for a wife. I really can’t imaging being able to go through this with anyone else. Thank you honey. Now that the Apaches have dropped off their gifts, it’s time for me to begin teaching him his many skills and secret knowledge passed down from generation to generation. Violet has been progressing well as you all can already see.